“Take Five” officially becomes “Chip Ahoy”! The next project was installing a bilge pump where none existed. This is where I cut with a hole-saw and installed the outlet. 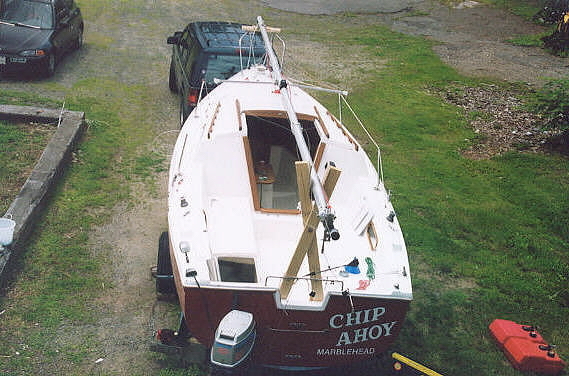 "Chip Ahoy" is official. 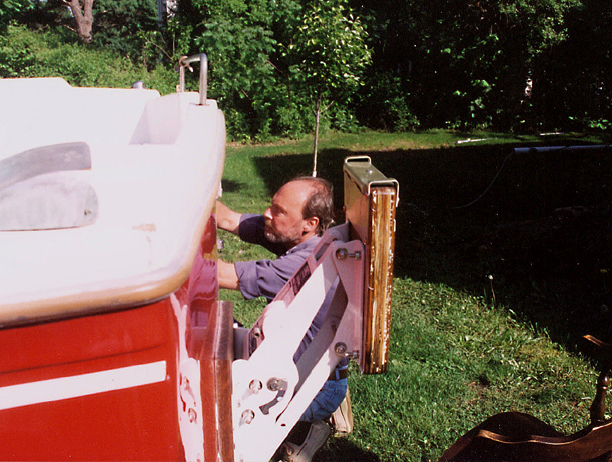 It was the first boat I'd lettered in some 15 years, but if you've done it for a living for over a decade, it's "like riding a bicycle." 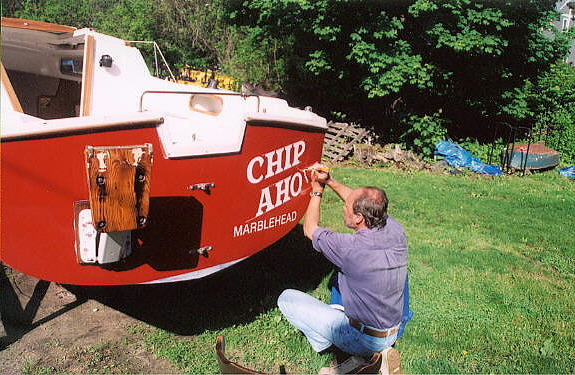 When I was trying to come up with an appropriate new name for the boat, Barbara awoke one morning with a brainstorm: "Why not call it 'Chip Ahoy'!" -- and I thought that was simply perfect, and so it became. Four letters over four letters painted over the removed four-over-four "Take Five" fit ideally. 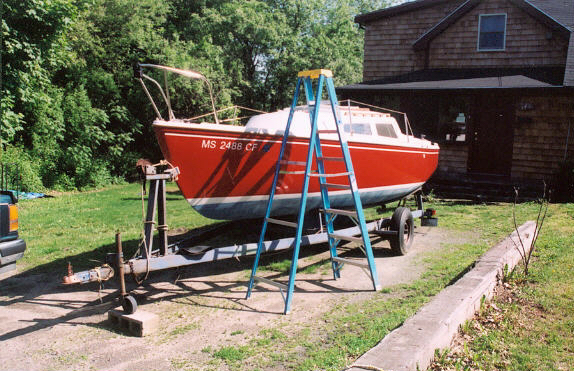 I've removed and refinished/rebuilt the outboard mount, another cold-weather indoor project, and remounted it. The winter didn't really end here until late-June. 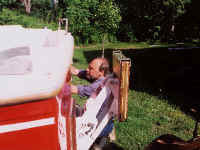 I've also added the transom scuppers kit since these photos were taken. 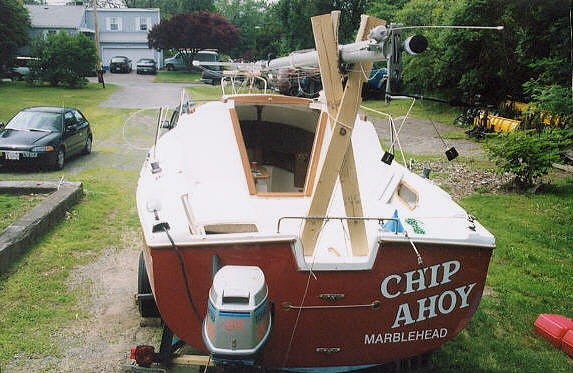 Once "Take Five" was replaced by "Chip Ahoy," I moved on to the next big project, the basic mast that came with the boat, and the boat's wiring. 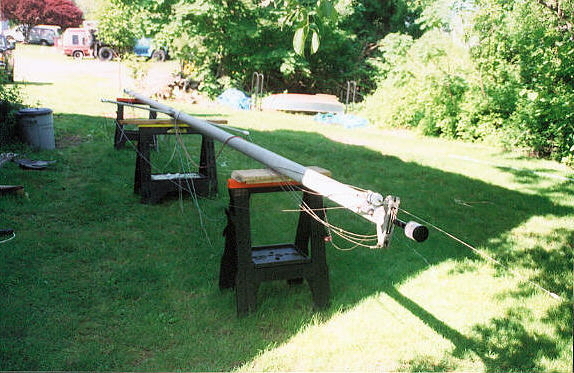 The mast rebuilt. I've added a complete wiring harness, anchor, steaming and deck lights, Shakespeare VHF antenna and cable, new electrical control panel and interior wiring with a new buss, new deck fitting for the wiring harness and one for the antenna cable, a Windex weathervane, and a topping lift kit. I've also installed an ICOM ICM402 marine VHF radio in the cabin. 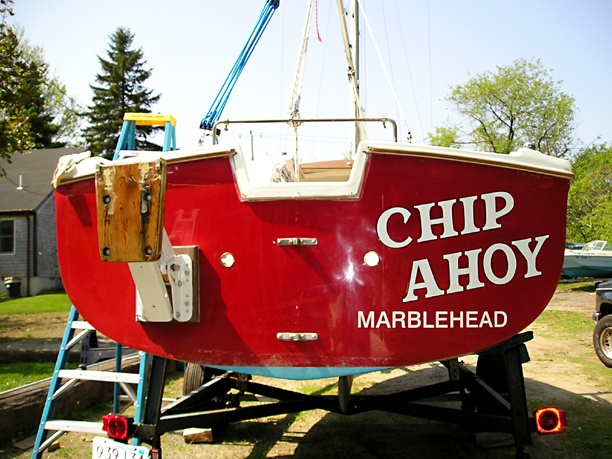 Chip Ahoy in very late spring, after polish, wax and a new registration number. I've also installed the stem reinforcement kit and new bow eye. 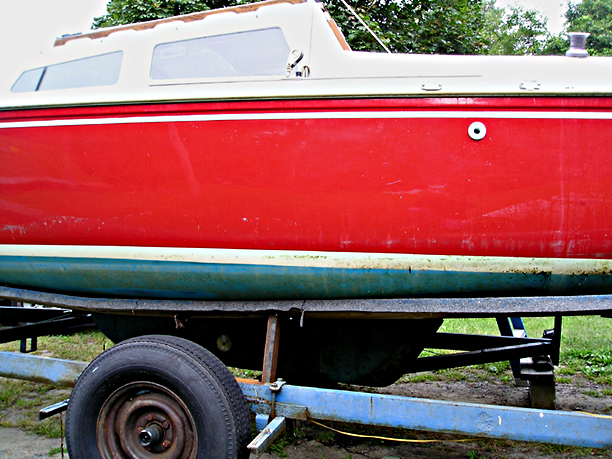 Getting the boat ready for the move to the boatyard, coming soon! 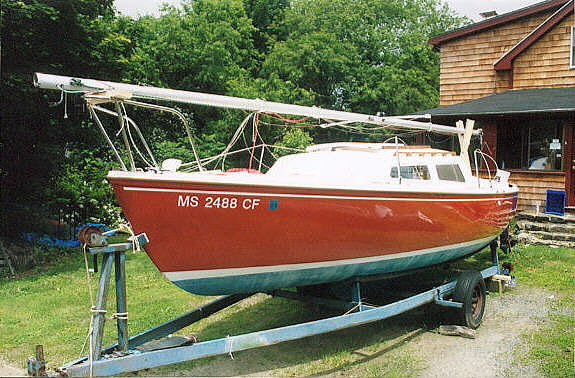 I just completed constructing the mast support, the aft carpeted 2X4s are lashed through screw eyes to the traveler and through the new transom scuppers I'd cut and installed (Catalina Direct kit). The mast is supported forward on the bow pulpit on a cut and carpeted 2X4 drilled for a line to pass through and fasten to the pulpit. 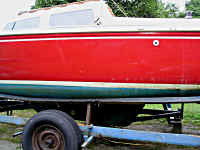 Chip Ahoy at last is ready for the ocean, ready to roll! "The cost for my own hole in the ocean"